DETROIT — When Marcy Klevorn retires this fall, Ford Motor Co. will lose a 36-year veteran with extensive data and information technology experience who rose to become the automaker's top-ranking female executive. Klevorn, 59, has been Ford's president of mobility since May 2017. 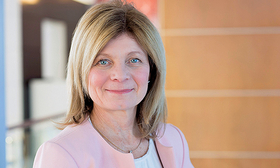 She has been one of CEO Jim Hackett's top three lieutenants and tasked with charting Ford's future, with instrumental roles creating its autonomous- vehicle unit and centering its mobility strategy on commercial services. She'll stay on as chief transformation officer, effective May 1, in charge of helping to refine Ford's corporate governance systems, among other duties, as the automaker seeks to make itself a more fit, profitable company. She will retire Oct. 1. "I have asked Marcy to work with me and the senior team to accelerate our transformation," Hackett said in a statement. "Marcy's decades of experience working with many of the leading companies in the tech space as well as the work she has done with the transformation of Ford IT and the establishment of Ford Mobility gives her unique knowledge to drive these initiatives." Jim Farley, 56, Ford's president of global markets, will take over Klevorn's mobility role in his new title of president of new businesses, technology and strategy. Klevorn joined Ford in 1983 on the telecom team. Her first project was putting together an internal phone system that allowed workers to call each other by dialing five-digit numbers. She has been named to the Automotive News list of 100 Leading Women in the North American Auto Industry twice, in 2010 and 2015, and spent her Ford career working in IT, with stints in the U.S. and Europe. From 2015 to 2017, she was Ford's group vice president, information technology and chief information officer. As president of mobility, Klevorn oversaw Ford Smart Mobility as well as global data, insight and analytics initiatives. She also was chairman of the board of Ford Autonomous Vehicles. She was responsible for the acquisition of Silicon Valley startup Autonomic and creation of Ford's transportation mobility cloud as well as the purchase of scooter company Spin. Klevorn started her career at Michigan Bell, one of the regional phone companies that evolved into today's AT&T, and first passed up an opportunity to work at Ford because it didn't employ enough women. "It's important that companies have visible role models for young women to see that it's something they can do," she told Automotive News in 2015. With Klevorn's departure, the designation of Ford's highest-ranking female executive goes to Joy Falotico, who was CEO of Ford Credit before becoming the automaker's chief marketing officer and head of the Lincoln luxury brand last year. Other high-ranking women include Elena Ford, a great-great-granddaughter of Henry Ford who serves as chief customer experience officer, and Kiersten Robinson, chief human resources officer. Three of the 14 members of Ford's board of directors are women.